As mentioned in my bio, I’m an Event Leader for Late Knight. I’ve been a part of Late Knight since my freshman year, making this my fourth year involved in this group and it has hands down been my favorite opportunity of involvement while at Saint Rose. I’ve had the opportunity to meet an amazing group of people, as well as plan, advertise, and run fun events for fellow students. So far the most memorable (and by far my personal favorite) event I’ve been involved in and co-led was the Murder Mystery Dinner in the fall semester of 2012. 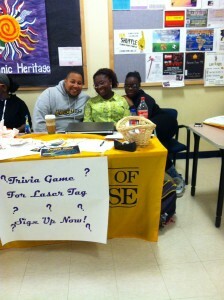 Late Knight is a group that works out of the Student Affairs Office under the administrative supervision of Latisha Barnett, the Director of Student Life. 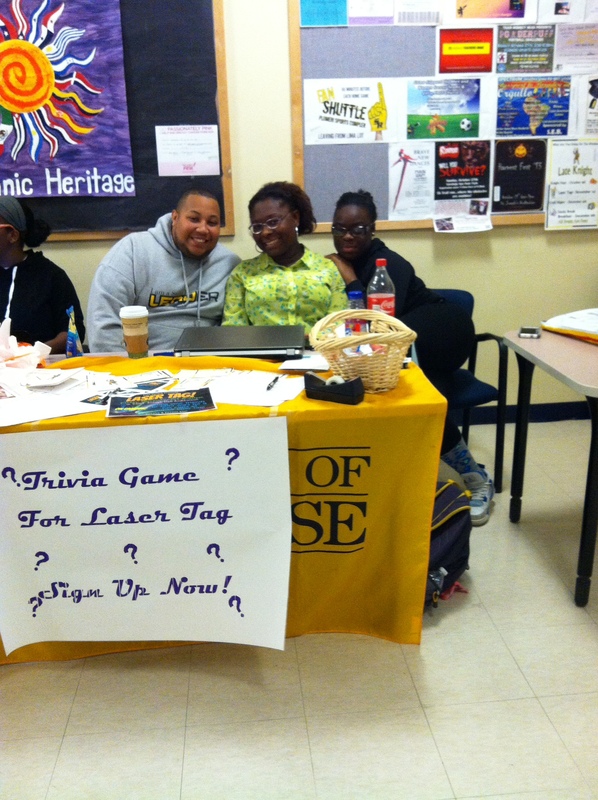 The group itself is comprised of both undergrad and grad students who make up committee members and event leaders. Events are typically held once a month on a Friday or Saturday night in an effort to show students fun activities that don’t involve the stereotypical college weekend night of parties. All of the events are completely free for students to attend, win prizes, and enjoy food! It also gives students a chance to have some stress-free fun with friends, which we all know is greatly appreciated and needed by all. 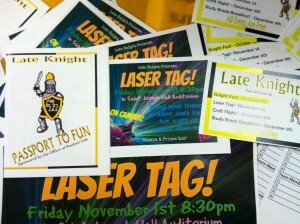 This year a new thing Late Knight is doing is offering event passports to students. The purpose of the passport is to keep a track of what and how many events a student has attended and at the end of the school year (Spring Semester), the student will be entered into a $500 raffle. We table in the Events and Athletics center about two weeks before each event to advertise and promote to students the event itself and also the passport program. Look for the next upcoming event posted outside/across the hall from the Office of student affairs in the events and athletics center! The next Late Knight event is Laser Tag, and it will take place on November 1, 2013, in St. Joseph Hall Auditorium. I’m also the leader for this event along with my friend and co-leader Arianna, and we hope to see some new faces there!